It describes a World War II allied air raid of Taipei on May 31, 1945, when Taiwan was still under Japanese colonial rule. The attack left more people dead and wounded than any other air attack in Taiwan’s history and displaced tens of thousands of people. The Governor-General’s office (today’s Presidential Office building), Taipei First Girls High School, No. 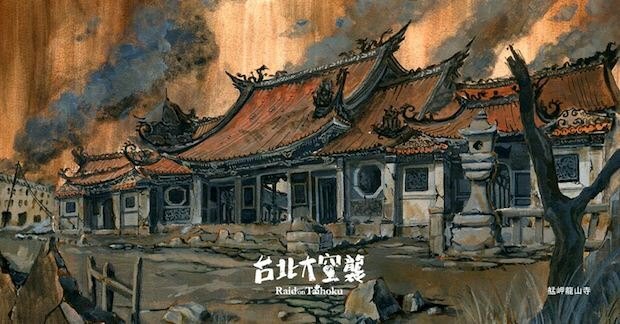 1 Taihoku High School (known today as Taipei Municipal Jianguo High School), and the Higashi Honganji Temple (which no longer exists) and other old buildings were all damaged. Some 70 years later in 2015, board game store owner KJ Chang ran into designer Teng Chieh-ming, who had a demo of a game he was working on, and the two hit it off. They wanted to optimize Teng’s concept and enlisted the help of artistic designer Boyea Lai, who once handled the visual effects of a National Day celebration, and graphic artist Nuomi, known for his perspective drawings of structures. They formed the team behind the board game “Raid on Taihoku,” Taihoku being the Japanese name for Taipei. It was only when the team was finally ready to design the board game, however, that they truly began to understand that period’s history. Even Teng, who thought up the product, once thought the bombings were conducted by the Japanese, when in fact they were the work of the United States Air Force. “This period of history is not that long ago, and this city is the place where we live, but we remain quite unfamiliar with this city we should know well,” says Chang, who produced the game. 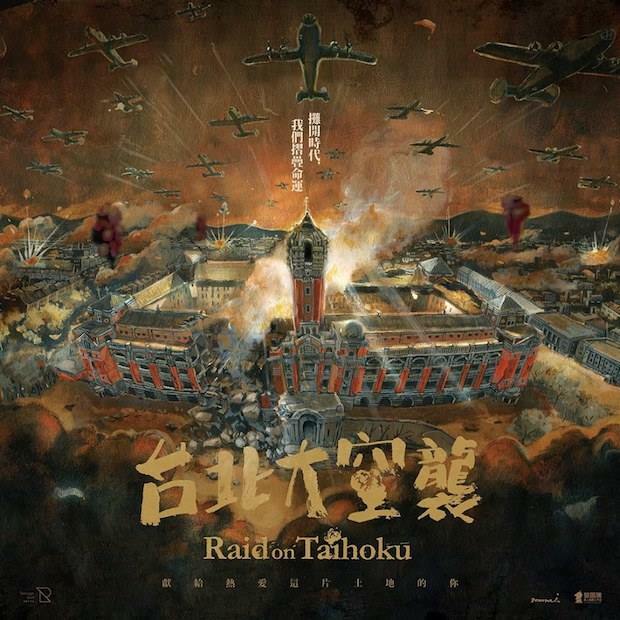 “Raid on Taihoku” raised more investor funds than any other board game in Taiwanese history, with more than 4,000 sponsors contributing over NT$6 million to the project. The initial print run of 5,000 games sold out, requiring many more print runs, and orders came in from many markets around the world, including the United States, Hong Kong, Malaysia, the United Kingdom, Switzerland and Japan. 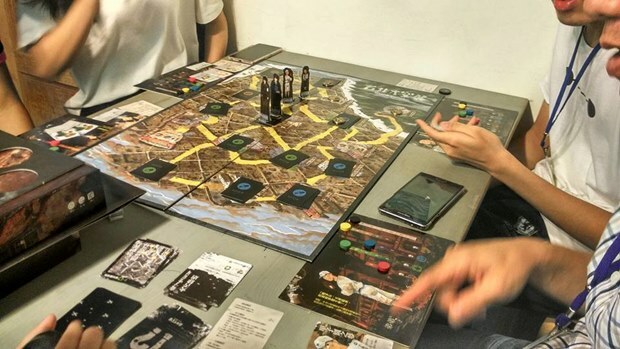 Yang Chih-chieh, an associate professor at the Southern Taiwan University of Science and Technology’s Department of Multimedia and Entertainment Science, says that, with a growing number of board games hitting the market in recent years, the board game’s ability to raise NT$6 million indicated its strong appeal and marketability. The game is set during World War II, and, unlike many other war-themed games focused on racking up kills, it requires players to cooperate to survive. The game’s slogan of “Win together or lose together” represents “Raid on Taihoku’s” most important feature – its emphasis on collaboration. The game is played over 10 rounds, and its eight characters, or roles, must persevere until the card proclaiming the “war has ended” is drawn to win. If any one of the eight roles dies, everybody loses. But each of them has their own distinct story and background as well as constraints they will find difficult to overcome in wartime. To deal with these many challenges, the players must communicate and work together if they want to emerge victorious. The grandfather in the game feels strongly about family and heritage, for example, and is required to find his ancestral tablet that has been buried in the rubble from the bombings. The father, patterned after Chiang Wei-shui, a doctor and democracy pioneer considered to be one of the most important figures in Taiwan’s resistance against Japanese rule, encounters an injured enemy soldier he must care for. He also has the mission of protecting cultural relics found in religious buildings. The youngest brother is a pitcher for No. 1 Taihoku High School and loves baseball, and even in the midst of war has to return to the school to practice. “War is exhausting and terrifying. One part of the game has you looking back at history and immersing yourself in this era,” Chang says. To enable players to experience the brutality of war and the scarcity of resources people face, the game also sets pets as edible, forcing players to face the dilemma of starving and dying if they behave ethically or putting their beliefs aside and eating their pets to survive. Family members are used in the game’s main roles, and because most players have families, the players feel more invested in the game. “They feel the joy they get from surviving is actually real,” Lai says, and that joy has actually become an alternative form of word-of-mouth marketing. The team’s members were mostly born in the 1980s and had never experienced war, so how were they able to figure out and decide the stories, restraints and missions for each role? Chang says several details, including the direction of the railroad on the map and the design of the game’s 70 supply cards, are based on photos from that time. Even the shovels, the names of cats and dogs, the characters, backgrounds, clothing and “constraints” of the main roles, the number of engines on the bombers, the position of holes in rooftops and the eaves shown in the game are all based on the historical record. “I often met with the publishers. This was one of those rare projects when after meeting with the publishers, we would still have to talk to historians,” says the experienced Lai, who has designed many board games but had never had to work so closely with historians before. Historical materials had to be collected at every stage of the process, and details included in the game were being changed right up until the last minute. At the same time, the refined hand-drawn maps were changed at least 10 times, and the same was true for the game’s cover. Speaking of the changes, Lai and Nuomi pointed to the cover of the game box and showed their frustration in unison. “At that point, I was already halfway done with the drawing and still hadn’t noticed any mistakes,” Lai says with a laugh. One of the changes involved the bombers shown in the cover illustration flying over a burning city. Historians noticed that the planes only had two engines when they should have had four, and for the sake of historical accuracy, the drawing was changed. But would the history of Taiwan’s wounds, presented in game form, spark controversy and conflict? 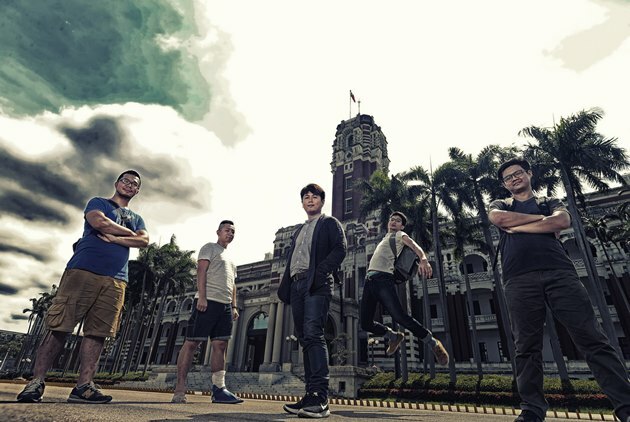 To the game’s developers, a key focal point beyond getting the game’s history, aesthetics and format right was figuring out how to tell this story of Taiwan as well as possible. “Because this was a board game that only Taiwanese could have made,” Chang says. Chang, who loves history, is well versed in China’s dynastic changes and many emperors, but the more he immersed himself in the “Raid on Taihoku” project, the more he realized how little he knew about Taiwan. Sensing that this “was not normal,” he began reflecting on the situation. “History is being forgotten, and we have pieced together these fragments,” Lai says, pulling out imitations of flyers dropped in air raids by many countries during World War II. Whenever the fundraising campaign reached a certain threshold, the development team would release a scrap of one flyer, symbolizing the historical memory of a certain period. Once the fundraising campaign ended, the fragments could be pieced together into a complete flyer. Chang grew up listening to his grandfather’s stories about World War II, and those memories remain one of his most precious links with his grandfather. Similarly, as the team was collecting information for the game, it heard of one person who walked for a full day and night from Tamsui to the Governor-General’s Office to look for the bodies of relatives in the rubble of the collapsed air-raid shelter. Those memories are as precious as they are painful. Another of the game’s designers, Wu Po-yang, says “Raid on Taihoku’s” success stems from the land and a past that schools have not taught. “This is dedicated to the people who love this land,” reads the last line of the video used to raise funds for the game, reflecting the hope of the game’s developers that “Raid on Taihoku” would become a cultural medium that teaches players about the real Taiwan. On the backs of the each of game’s supply cards are little knots, symbolizing the different types of constraints that connect every player and every Taiwanese together, helping the game resonate with players and lovers of history alike.